So you want to have more time to work on what you want to work on. You want to spend less time at your job and more time doing your own thing — like developing a skill, interest or area of knowledge to the point where you can quit your day job for it. In practice, this probably means running a business of some sort or becoming a freelancer, but for the purpose of this article, let’s just call it your side project. Your first action, of course, should be to spend all of your spare time doing it. But now let’s say you’re in a position where your spare time is not enough — your progress is too slow. At this point, you could probably benefit from an upgrade in mindset. A more focused, disciplined and productive you could carve out the equivalent of a few extra hours each day and accelerate progress with your side project. 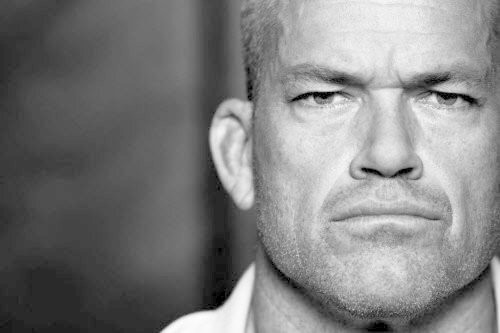 If that’s resonating with you right now, check out Jocko Willink’s Discipline Equals Freedom—an all-guns-blazing guide to taking your life to a new level. Tip: Download the audio version (2 parts) which consists of 58 1 to 3 minute long clips. I’ve recently been listening to a few before bed and when I wake (try setting your favourites as your alarm clock), and feel evermore pumped to start the day and smash through what awaits. It’s good to have someone there with you who’s more aggressive and determined than you are. In all honesty though, not everyone is going to be primed right now for full-scale mindset and lifestyle shifts as Jocko might hope. You have to really want it — and if you’re just at the start of this journey, other changes first might be more realistic. Let’s reassess things: What is the function of your job? An alternative intermediate step involves a simpler mindset shift — starting with clarifying to yourself what it is you’re actually doing with your time. You spend 40 hours a week at work, plus the commute, plus the getting ready in the morning and unwinding at night. What’s it all for? What exactly is the function of your job? Your job is there to give you an income. And with that income, you obtain things. You use your income to pay for a roof over your head, bills, food, health & fitness—life essentials. You also spend a bit on education and self-improvement, plus some investments/savings for a rainy day — also all life essentials, you could say. Then there’s a load of other stuff you spend the rest of you cash on — extras, luxuries, lifestyle stuff. Pieced together, the function of your job — as your life is currently structured — is simply to enable you to obtain these things. How much time is that purchase costing you? We normally attribute each hour we work to a specific dollar amount of income (i.e. our salary in $/hr terms). We can also do a similar exercise and attribute each dollar amount of spending to a specific number of hours worked. Let’s say your net salary is $2,400/month and you work a standard 40 hours/week. Based on a 4-week-month, you earn the equivalent of $15/hr. 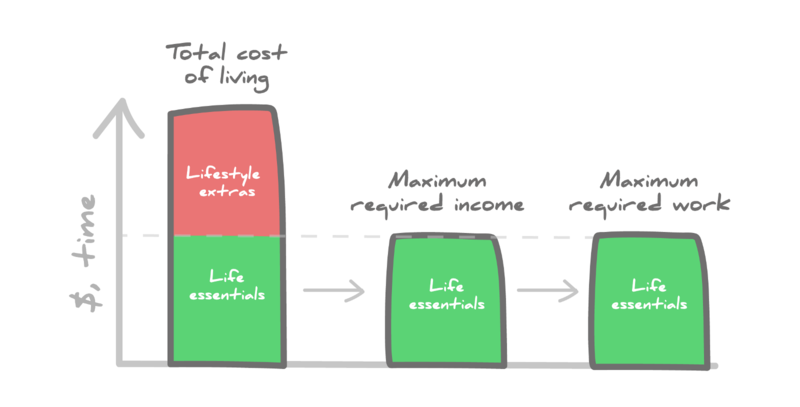 Your life essentials cost say $1,200 a month, meaning you work 20 hours a week or 80 hours a month to fund them ($1,200/$15 = 80 hours). You need to cover these expenses no matter what, but you also don’t need anything more than that. This means that this $1,200 actually represents the maximum required income from your job, and the 20 hours is the theoretical maximum amount of time you need to work your job (maximum required work). Anything else you spend your money on is, by definition, non-essential — it’s all lifestyle stuff. You might not initially see it as such, but you could cut it back drastically without materially reducing your quality of life. If you don’t agree, consider that you live in better conditions than kings & queens of the past. In the context of history, you live a life of luxury. An example might be the $120/month you spend on coffee. 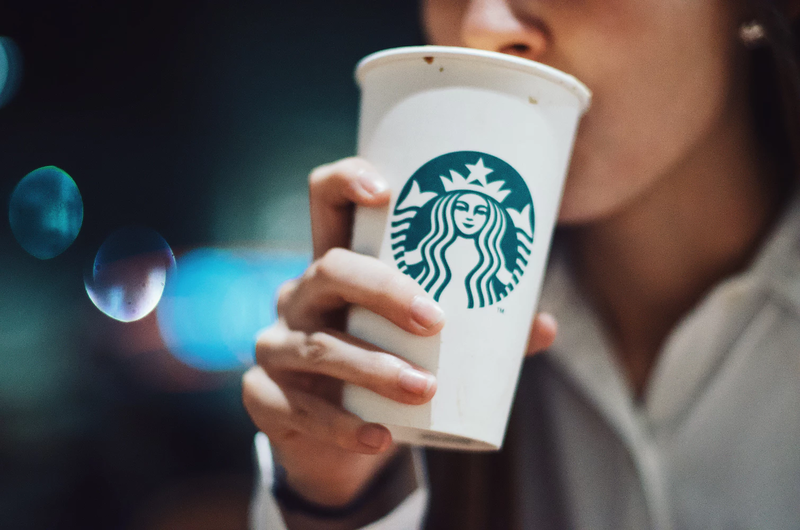 At your $15/hr salary, that morning Starbucks is costing you 8 hours of time a month. That dessert you go for every time you eat out on Friday night — $45, or 3 hours a month. $150 online shopping, that’s 10 hours. That slightly nicer apartment for an extra $135/month just because, another 9 hours. It all starts adding up very quickly. Based on your own definition of what’s essential and what’s not, you can easily put dollar and hour figures on your outgoings, and see how many more hours than necessary you are working your current job. From there you can cut back on the unessential luxuries, and in doing so reduce the requirement to work the hours to fund them, ideally down to your maximum required hours. In practice you might not be able to just cut 10 or 20 hours out of your working week as and when you please. Most jobs/employers don’t work like that. 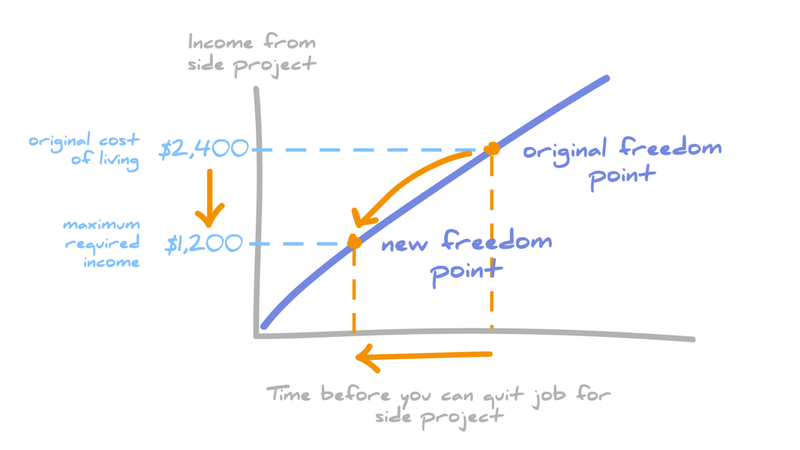 But — When you first started your side project, your objective might have been to replace 100% of your current income (e.g. $2,400/month). Only then could you quit your job for it. But now you know you only need to cover your maximum required income. By cutting out lifestyle costs such that your total cost of living is far closer to that point, your financial target is so much lower, meaning you can transition from your job to your side project far sooner. Alternatively, perhaps it is feasible for you to go from full-time to part-time at work. But let’s say here that the total cost of your life essentials — and by extension your maximum required income — is $1,600. You go part-time, halve your hours and halve your income to $1,200. Your side project now needs to generate $400 for your total income to cover your required income. Upon reaching this point you can’t necessarily quit your job outright, so this is no longer a freedom point. But — the target level of development of your side project is even lower ($400 vs $1,200), you’ve slashed the time you spend in the office and now have far more time to spend building your empire. In the short/medium-term your switch from steady monthly salary to side-project might translate into lower overall income. While your new stoic mindset says you should be fine with that, you might not want to live on bare essentials forever. However, by restructuring your life such that more productive time is spent on an area of interest, you increase the chance of developing a competitive advantage in that area, translating into opportunities for greater income in the future. Cut the luxuries out of your life, cut your cost of living and make it easier to get your side project/freelance thing up and running. Cut the amount of time at work, transfer that time into activities you want to work on and continue learning about, and grow something that’s more meaningful and enjoyable for you. Thanks for reading! Thoughts, critiques, experiences to add? Leave a comment a below!